I have to go see this place! 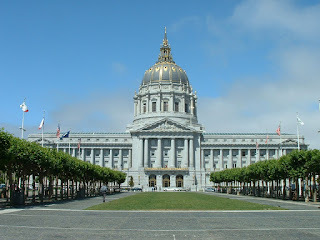 The San Francisco City Hall, built in 1913-1915, is a grand example of the teachings of the Beaux-Arts movement. Barely noticed in Norway, the Beaux-Arts architecture combined the purely classical with other historical elements, traditions and an enormous will to ornament, and was a big hit in such countries as the USA, France and Canada. I first saw the building yesterday, in the movie "Milk". It was really good, and hereby recommended to all. Other than that, a really nice evening.